Here’s the answer to the latest Birding Quiz. Many of you nailed it, despite the somewhat tricky nature of the photo. Click below for the answer. A female Northern Cardinal eats from a feeder in Stamford, Conn., this spring. 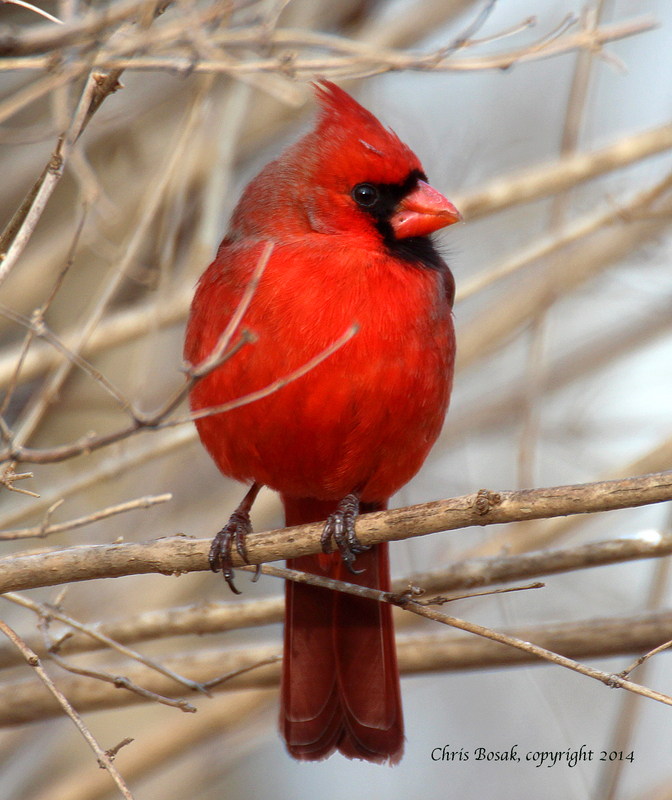 With the all the color in the bird world passing through these days in the form of warblers, orioles, tanagers, grosbeaks and buntings, it can be easy to forget about our ‘ordinary’ colorful birds, such as cardinals. 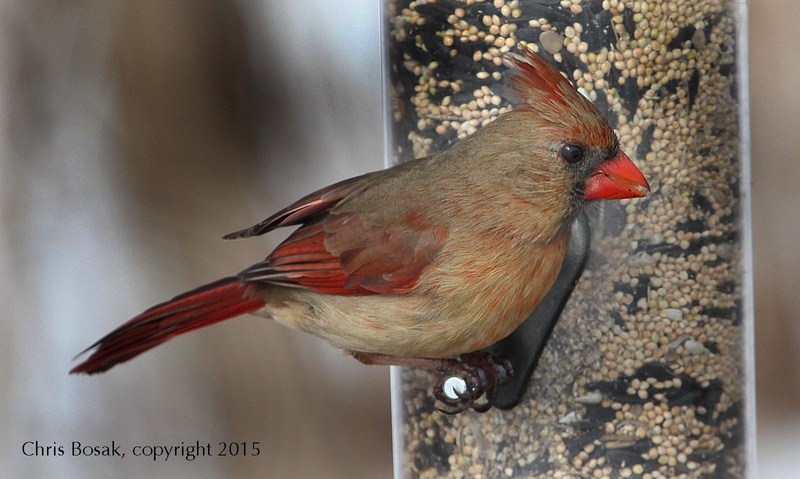 Yes, even the female Northern Cardinal is beautifully colorful — just not as striking as the brilliant red male. So here’s a shot of one of these pretty ladies — really nothing ordinary about her. 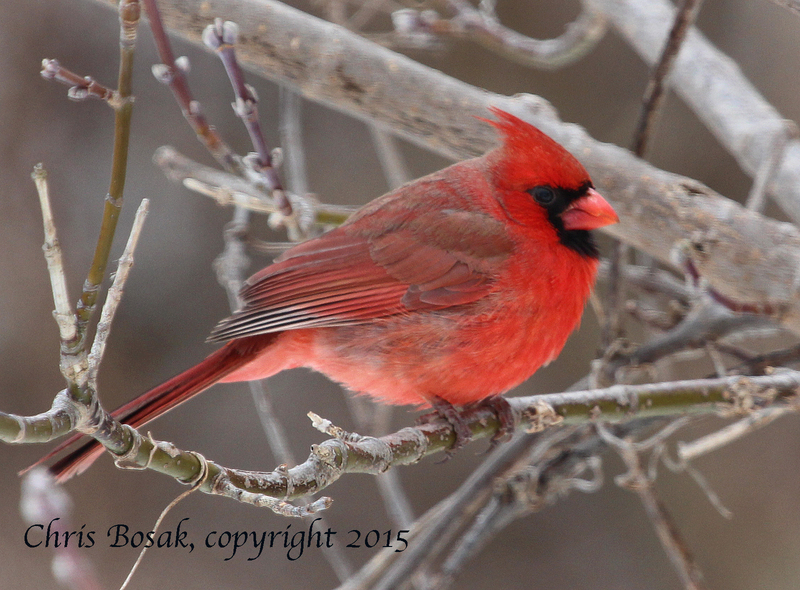 A male Northern Cardinal in Stamford, Conn., March 2015. As spring takes over from this long winter, here is a photos I took this winter that never saw the light of day _ until now. Happy spring, everybody. A Northern Cardinal, left, and an American Goldfinch perch in a tree near a feeding station at Cove Island Wildlife Sanctuary in Stamford, Conn., in March 2015. You don’t always see cardinals and goldfinches perched near each other, but when you are watching a feeding station at which the birds are somewhat skittish, anything can happen. The usual assortment of birds were enjoying the feast at Cove Island Wildlife Sanctuary in Stamford, Conn., the other day, but other than occasionally being perched on the same feeder, the species generally kept away from each other. However, the birds scattered every five minutes or so because of some unseen (by me anyway) force and sometimes the birds would find themselves perched next to an individual of another species. I was focused on getting a photo of this cardinal, but noticed the goldfinch off to the right, so I decided to get them in the same frame. Why not? A Northern Cardinal perches on a branch in New England in spring 2014. Here’s my next photo in the series of 2014 photos that I never got around to looking at and posting. Everybody loves Northern Cardinals. I took this shot in 2014, but to be perfectly honest, I don’t really remember the details. I found it in a random folder and only sort of remembered even taking the photo. Some days of shooting are like that: The action is so fast it’s hard to keep track of what you’re shooting. Other days, of course, not so much. I believe I took this shot at Cove Island Wildlife Sanctuary, but it was definitely in 2014. Trust me on that one. Why are birds attacking my windows? 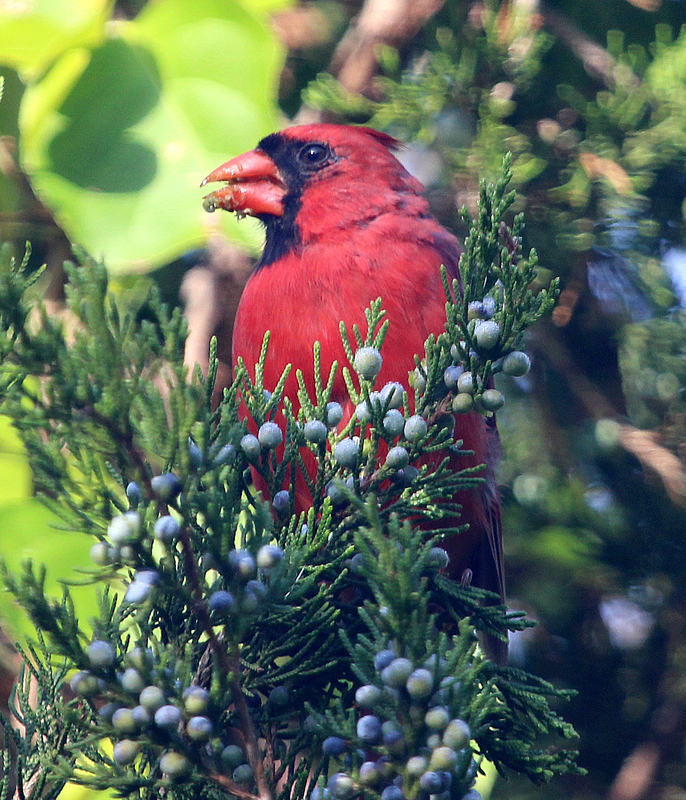 A Northern Cardinal eats berries from a cedar tree. The good news is that signs of spring are everywhere in the birding world. The bad news is that this winter doesn’t seem to want to loosen its grip. So for now let’s focus on the signs of spring and think warm thoughts. Not quite bird related, but I’ve noticed several plants poking out of the ground already. A nearby bed of daylilies has produced several of the plants jutting out about an inch already. In the bird world, yes, American Robins have been seen in large numbers, but they are not necessarily a sign of spring as many robins stick with us throughout winter. 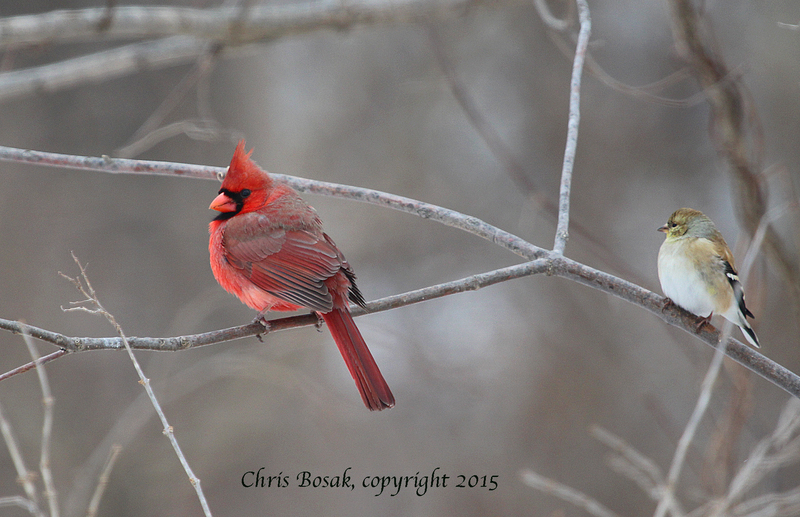 To me, a sure sign of spring is hearing cardinals sing for the first time. Cardinals have been “chipping” or calling all winter to keep in contact with each other, but I’ve heard on a few occasions cardinals singing their famous songs. I assume they were male cardinals, but female cardinals also sing. 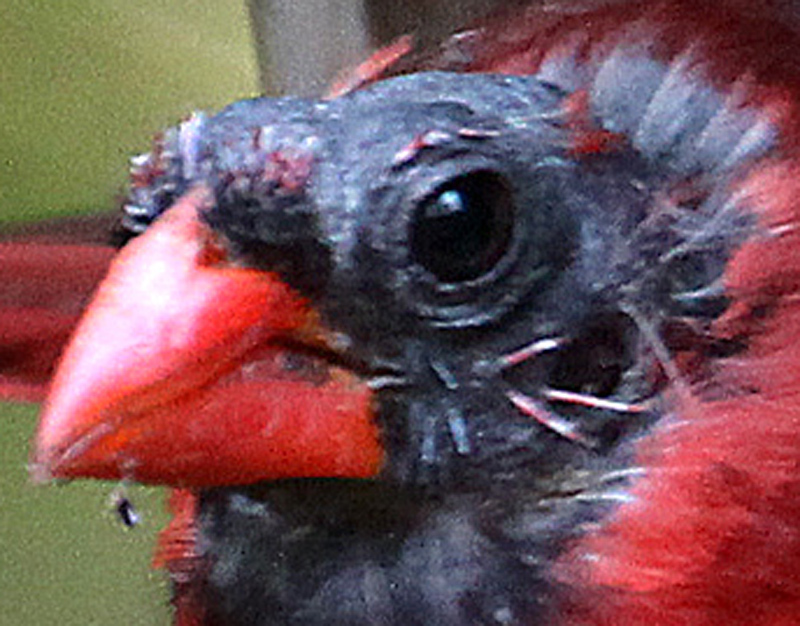 Cardinals also have a variety of loud, whistling songs. Read the rest of the column by clicking here. 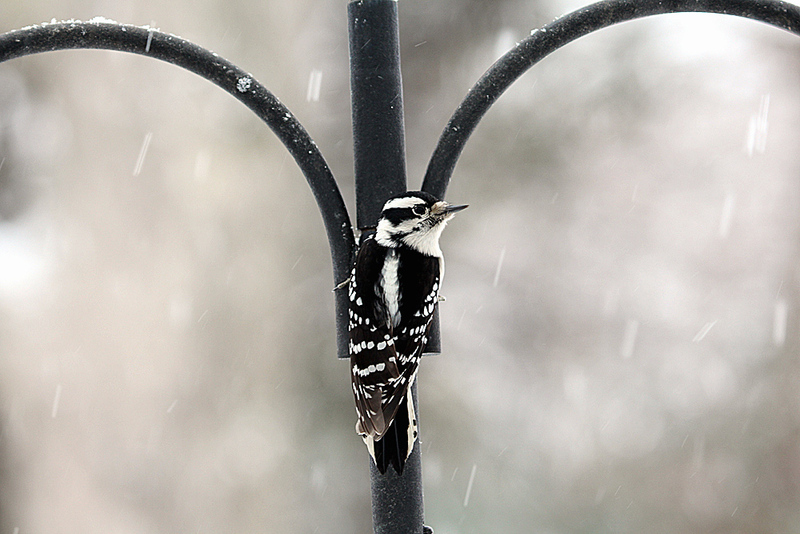 A female downy woodpecker perches on a birdfeeder stand before heading to the suet feeder during the Dec. 14, 2013, snow fall. The snow always brings a lot of birds to the feeders. The Dec. 14, 2013, snowfall was no exception. Here are a few shots of Downy Woodpeckers in the snow. Juncos, White-throated Sparrows, Mourning Doves and Northern Cardinals ate seeds on the ground below. The Downy Woodpeckers owned the suet cake, other than when a much larger female Hairy Woodpecker swooped in to take over. Send me your snow bird photos at bozclark@earthlink.net and I’ll post them on my “reader submitted” photo page. 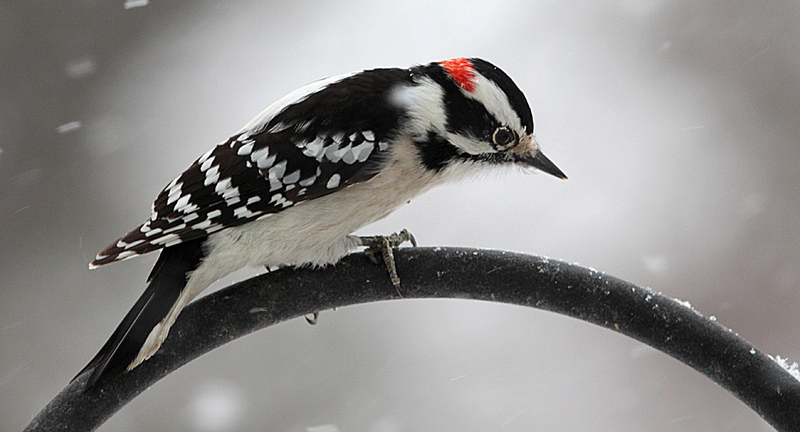 A male downy woodpecker perches on a birdfeeder stand before heading to the suet feeder during the Dec. 14, 2013, snow fall.